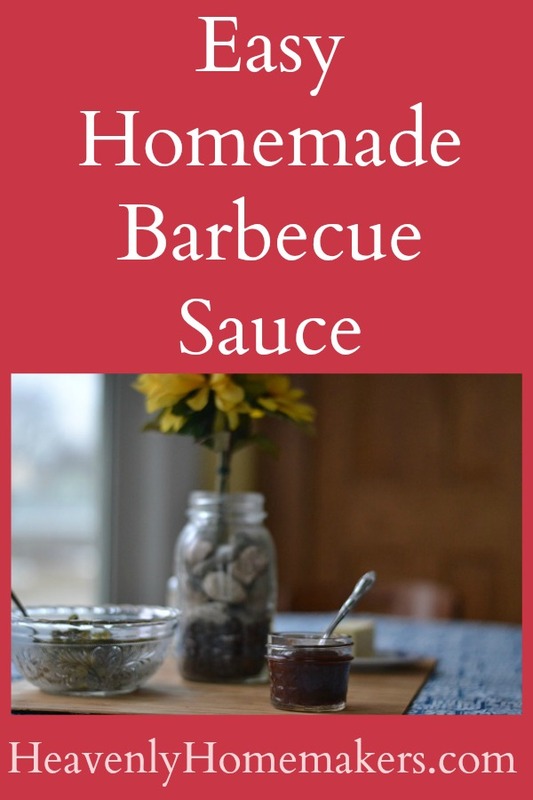 I’ve had several requests for my homemade barbecue sauce recipe. 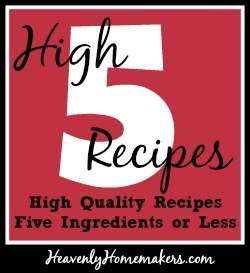 Turns out…it’s a high five recipe! Doesn’t get much easier than that! As for the ketchup, I use an organic, no high fructose corn syrup variety. Muir Glen is my favorite. 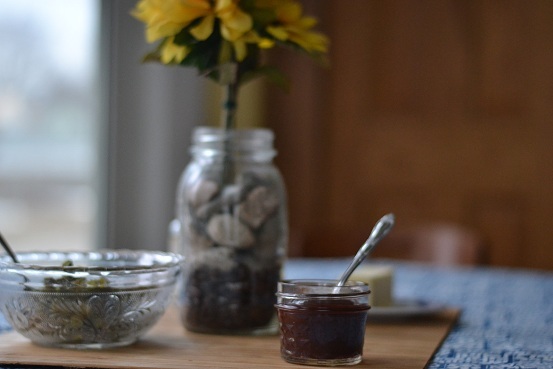 I mix this Barbecue Sauce up as a dip for our meatballs or Popcorn Chicken…YUM! Sometimes I put a few pieces of chicken into the crock pot, dump the sauce over the top, and let it cook slowly for a few hours. It’s the easiest main dish ever! Get the details on my Crock Pot Barbecue Chicken Breasts here. It’s also fantastic on Grilled Barbecue Chicken. Or, sometimes I add it to leftover roast beef for BBQ beef sandwiches. Even more fun? Make your BBQ Beef into Barbecue Beef and Cheese Hot Pockets. They are freezable so you can make them ahead and pull them out as needed. What all do you put barbecue sauce on? Oh, and by the way – I really have no idea what “liquid smoke” is. I’m assuming that it isn’t the healthiest ingredient in the world. BUT…it makes for a yummy, easy BBQ sauce. This version is MUCH healthier than the HFCS versions I could buy at the store. If I ever figure out how to turn smoke into a liquid and put it into a bottle all by myself, you’ll be the first to know. My husband brought a similar bbq recipe into our marriage. A little vinegar instead of the liquid smoke. It is part of his childhood favorite meal. Homemade mac and cheese served with hot dogs that have been cooked in the bbq sauce. I doubted the combination but it isn’t bad! I haven’t made it in awhile, maybe it is time to cook some! I’ll also use the leftover pork for fried rice, stir fry, casseroles, etc. That’s the same recipe I use! My children (and I) LOVE to put this sauce over meatballs and then bake for 30 minutes. Yum! Liquid smoke really is liquid smoke. I remember seeing something on the Food Network about it. The process takes the smoke and infuses it into the liquid. Apparently ingesting it is a whole lot safer than breathing it. So easy! Have you ever tried to make your own ketchup? I was trying to decide what to make for dinner tonight – chicken with your BBQ sauce is it! I also love to use leftover BBQ chicken to make BBQ chicken pizza with caramelized onions! Mmm.. I love reading your site! I will have to try this sometime soon. Btw…there was an episode of Good Eats (with Alton Brown) on Food Network where he did make liquid smoke, though it was rather time consuming. And, if memory serves, he said it wasn’t really worth it for most people to make. Here is a link to another artice on how to make it: http://www.thesmokering.com/forum/viewtopic.php?p=31533&sid=07d4f25fab7911c06206898044a6c0ff. Nope, liquid smoke isn’t too bad for you at all! Through A Year of Crockpotting, I found this post at The Crockpot Alchemist that made me feel much better about using it. I make it with organic ketchup which I realize is only a little bit healthier than regular. Making homemade ketchup is one of the things on my list of things to try. Combine all ingredients with a wire wisk. Blend well. Place into a glass jar and chill to blend flavors. How long does this usually last, Jen? Can’t wait to try it. I’ve never had a batch go bad. I’ve had it in the fridge for about a month before. Good luck! Any suggestions for a sub for the evap. cane juice? Would sucanat or agave nectar work? Thanks! Melissa J, I think sucanat or agave would work fine. A check of the label on my Famous Dave’s BBQ sauce shows hydrolyzed soy protein and sodium benzoate. Maybe organic BBQ sauce is not any healthier than this recipe. But this recipe is much healthier than the only BBQ sauce sold within 50 miles of me. YUM! That sounds SOOOO good! Stop by my blog Garibay Soup to read about a huge giveaway to the launch of my new inspirational carnival coming Monday called Just to Motivate Your Monday!! I have a bottle of Organicville Ketchup (I contacted the company once to make sure that “natural ingredients” DID NOT include MSG). I like it, but homemade sounds so much better. Now I just need a glass ketchup jar to put it in. I don’t think my husband would be too thrilled at the idea of spooning his ketchup out of a mason jar! Also, I have organic BBQ sauce from Azure, (this time, next time I’ll make my own), and it also uses “natural liquid smoke.” It would be good to know more about the process, but it seems pretty okay to me (kind of like non-organic vodka). You could save the ketchup container and wash it with the dishes. Then just reuse it so he doesn’t have to spoon it out of a mason jar. That sounds great! We like to cook pork chops and chicken on the grill with barbeque sauce. I found liquid smoke at Whole Foods, so it can be all that bad, right?! I asked friends for ideas on what to do with chicken and twice bbq came up. So barbecue sauce went on my grocery list because it sounds yummy right now. Then I got to thinking, most things are made with hfcs thrown in it. Wonder if Laura has a recipe for barbecue sauce…? Sure enough there it is and bonus! Someone gave a recipe for homemade ketchup as well! I so cant wait to try these recipes on Friday! Made this the other night (for my reluctant hubby who didn’t like a different recipe I had tried). He gave the thumbs up! So, now I just have to make more so we don’t eat it all in one meal. Thanks! Thank you so much…this BBQ sauce is great. We are having a super bowl party and I went to make the little smokies and realized that we were totally out of BBQ sauce. I have seen the receipe before but never had made it. Whipped it up today and my husband said, “this is a keeper!” You have never let us down, even in the tightest pinch. Thank you so much – little do they know it is better for them. I’ve never actually kept track, but I’d say it would last for at least two months. Do you use fresh minced onions or dried? I have been using a teaspoon of dried minced onion, and it is wonderful, but I was just curious what you use. made this last night and put it over a couple cups of chicken in the crockpot like you suggested and served it over brown rice. It was delcious! Thanks! Where can I find liquid smoke without msg in it? I use Wrights brand, which I believe I got at Walmart. Since I stopped purchasing my son’s favorite storebought honey BBQ sauce made with HFCS I have been searching for a recipe he approved of. I used a tad more honey and spoonful of molasses to create a sauce he approves of. This is very important to him since he uses BBQ sauce like most kids use ketchup. I now have a happy son again! Thanks! How much does this make. We are a family of 8 so it is always challenging to determine various recipes and to adapt them to our family when there is not a serving size (I know this is a bit hard to determine with BBQ sauce). How many does it feed for your family if you are making the BBQ chicken? Thank you! I am digging in and enjoying your site so very much! SO many great recipes and ideas. Thanks for sharing! Hi! I know this is an old post but I was wondering if I wanted to make this using your homemade ketchup would it just be as easy as substituting the homemade ketchup in the recipe? Or would I need to change something? Thanks!! I love your blog! It has been such a help in making homemade healthier versions of things for my family! Thanks for sharing this yummy, easy recipe.